Allerton is a suburb of Liverpool, England. Historically in Lancashire, it is located 3 miles (4.8 km) southeast of Liverpool city centre, bordered by Mossley Hill, Woolton, Hunt's Cross and Garston. Allerton has a number of large houses in the prestigious Calderstones Park area, with mainly 1930s semi-detached housing around the shopping area of Allerton Road. Allerton is paired with nearby Hunts Cross to form the Allerton and Hunts Cross city council ward. The population of this ward at the 2011 census was 14,853. In the Domesday Book it appears as Alretune meaning 'the alder enclosure', derived from the Old English alr 'alder' and tún 'enclosure or village'. Allerton was made an urban district by the Local Government Act 1894, and added to the county borough of Liverpool on 9 November 1913. In the past ten years many new bars and restaurants have opened on Allerton Road, Mossley Hill and it is a popular place for pubgoers. Allerton is served by two railway stations: Liverpool South Parkway on the border of Allerton and Garston (it is the railway track running from Liverpool South Parkway from the old Allerton Station that separates Garston from Allerton), and West Allerton on Booker Avenue. Both stations offer services to Liverpool city centre and Manchester, but Liverpool South Parkway also has services to Southport and Hunts Cross (on the Merseyrail Northern Line) and also the fast service to Birmingham. The former Allerton railway station has been replaced with Liverpool South Parkway, although the old platforms are in use at the new station. The nearest major bus stop is at Liverpool South Parkway, with the 86 service to the city centre and bus shuttles to Liverpool John Lennon Airport. There are several bus stops around Aigburth with links to various districts throughout the city and also the city centre. Allerton Road features in the Beatles' song, "Penny Lane". The 'shelter in the middle of the roundabout', the barber shop and possibly the bank (whose banker 'never wears a Mac') mentioned in the song are all located on Smithdown Place, Mossley Hill, which is at the junction of Allerton Road, Penny Lane and Smithdown Road. 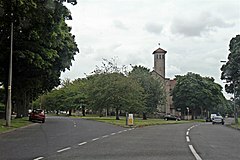 The suburb of Allerton also features in the first episode of BBC Drama Spooks, where a bomb exploded outside the home of a family planning doctor. The attack was organised by a group of pro-life campaigners. ^ "City of Liverpool population 2011". Retrieved 11 January 2016. ^ "Unit History of Liverpool". A Vision of Britain Through Time. Archived from the original on 31 August 2012. Retrieved 26 January 2006. ^ "Burglars target homes of Liverpool's Mane and Lovren". BBC News. 2 November 2017. Retrieved 20 February 2019. ^ "Sadio Mane: Liverpool forward's house burgled during Champions League match". BBC Sport. 20 February 2019. Retrieved 20 February 2019. Wikimedia Commons has media related to Allerton, Liverpool. This page was last edited on 20 February 2019, at 22:26 (UTC).